The flag of Alberta, Canada was adopted on 1 June 1968. The flag has the proportions 2:1, with the provincial shield of arms in the centre. The shield's height is 7/11 that of the flag's height. 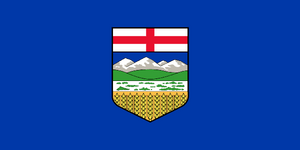 The provincial colours, adopted in 1984, are blue and gold (deep yellow); they are also referred to as ‘Alberta blue’ and ‘Alberta gold,’ appearing on the flag/shield in the sky/background and wheat background, respectively. Century 21 Grande Prairie Realty Inc. - Full-service agency with agents specializing in residential, commercial, acreage and farm properties. Includes listings and contact information. Delaine Haugen - RE/MAX Grande Prairie Associates Realty - Includes listings, home search, service area, and contact information. Grande Prairie Real Estate Board - Real estate listings for the city in a comprehensive, concise, and updated format with links. A multiple listing service where you can find the real estate and realtor of your choice in Grande Prairie. Jack Ouellette - RE/MAX Grande Prairie - Includes agent profile, listings, community links and contact information. Kevin Vobeyda - RE/MAX Grande Prairie - Provides community information, as well as property listings and mortgage calculator. Larry Dueck - RE/MAX Grande Prairie Realty - Agent profile, community information, and list of professional services for buyers and sellers in home, business and farm real estate sales. Len Freisz - RE/MAX Grande Prairie - Provides property listings, community links, and real estate tips. Lloyd Friedel - RE/MAX Grande Prairie Associates Realty LTD - Includes agent profile, listings, market evaluation, and contact information. Michelle Boyd - Sutton Group Grande Prairie Professionals - Includes information for buyers and sellers, MLS reports and location. Mitch Koll - RE/MAX Grande Prairie Associates Realty Ltd. - Provides agent profile, community links, and information request forms. North American Leaseholds - Property management company with six separate apartment and townhouse communities. Offers company profile, property information and contact details. North Ridge Land Developments - Includes site plans, aerial photos, city amenities and demographic links, location map and contact information. RE/MAX Grande Prairie Associates Realty Ltd. - A complete listing of all RE/MAX agents in Grande Prairie, and surrounding Peace Country. Includes e-mail and web sites. Sean Doerkson - Mortgage Specialist - Provides services at the Royal Bank. Includes rates, calculator, FAQs, application form and contact information. The Shores - An adult gated community. Includes home features, floor plans, prices, photo gallery, location and contact information. Silver-Pointe Village - Full-service manufactured home community. Includes lot listings, lease and contact information.